Congrats and Cheers! to the Holiday Ale Festival and beer fans who helped raise $20,000 for the Children's Cancer Association MusicRx program. PORTLAND, Ore. – Nearly 14,000 beer fans took part in the 19th annual Holiday Ale Festival Dec. 3 through 7 at Pioneer Courthouse Square. Collectively, they helped raise $20,000 for the Children’s Cancer Association MusicRx program, which delivers the healing power of music to children battling cancer and their families. Heated tents, coupled with mild temperatures outside, provided so much warmth that the coat check took in a record number of garments – great news for the Children’s Cancer Association. All the proceeds brought in from the coat check, the Crater Lake Root Beer Garden, a raffle, and sales of the festival’s classic pin up girl posters and temporary tattoos are annually earmarked for the non-profit. At the festival’s conclusion, organizers count all the funds, round up to the nearest $1,000, then double it, and double it again. Festival organizers are excited that this year’s donation will make an immediate impact on the holiday needs of the Music Rx program. The Northwest’s only outdoor winter beer festival featured 54 beers, ciders and meads in the main lineup, all of which were made or blended specifically for the event, or were vintage offerings not commonly served in the region. The event is billed as an opportunity for brewers to connect with their fans, and this year’s lineup did not disappoint. While all the products were well received, a few rose to the top in terms of popularity, including Hopworks’ The Incredible Abominable of the Enchanted Barrel Forest (Barrel Aged Imperial Winter Ale), Firestone Walker’s Luponic Distortion (Double IPA), Fort George’s Santa’s Dinner Jacket (Bourbon Barrel Aged Imperial Red Ale), Old Town’s Bluth’s Original Chocolate Banana Hefeweizen (Chocolate Bavarian-Style Hefeweizen) and Finnriver’s Stone & Pome Cider (Barrel Aged Plum and Peach Cider). Three of the most talked about beers were Eel River’s Gargantua II (Whiskey Barrel Vanilla Imperial Strong Ale Blend), McMenamins Edgefield’s Lord of Misrule (Rum Barrel Aged Imperial Mexican Mocha Stout), and Feckin’s Top O’ The Feckin’ Mornin' (Imperial Espresso Milk Porter). The festival also featured nearly 40 specialty kegs throughout the event, including a six-year vertical of The Abyss by Deschutes Brewing, and a 2009 cask of JW Lees & Co Harvest Ale. There were two separate meet-the-brewer events, the first with Stone Brewing’s Kris Ketcham and Dr Bill Sysak; and the second with Bear Republic’s Peter Kruger and Roger Herpst. Attendees were treated to the aroma of fresh roasted nuts from Family Tree Nut Co., and hearty fare from Urban German Grill and Bunk Sandwiches. The 11th annual Sunday Beer Brunch, a separate ticketed event held at the festival site on Sunday morning of the event, was a sold out affair featuring vintage beers not in the festival and special large format bottles paired with a European style buffet. 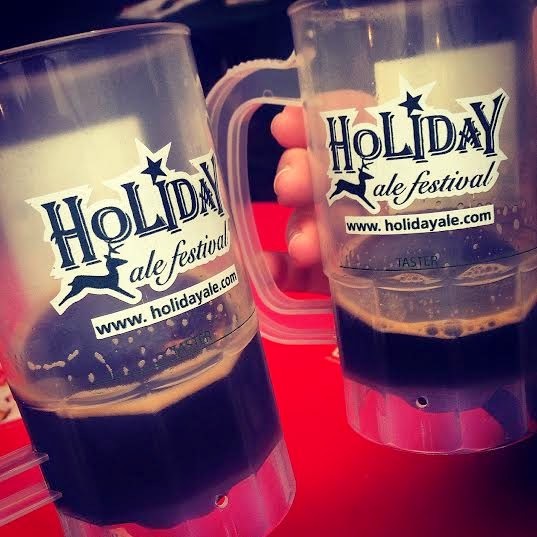 The Holiday Ale Festival is a five-day event that annually starts the Wednesday following Thanksgiving. Dates for next year are Dec. 2 through 6. For more information, visit www.holidayale.com.